En votre absence, vos clefs de voiture devront rester à la réception du parking. ParGentle is your competent partner for best service and secure, comfortable uncovered parking at Düsseldorf Airport. With this parking option, you can drop off your vehicle directly at the airport and hand it over to a member of staff who will drive your vehicle to a secure car park and will drive it back to the airport when you return. Your vehicle will be parked in a video monitored, staff monitored and well lit car park, secured and available all day, 365 days a year! 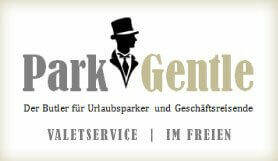 ParkGentle works with professionally trained and experienced staff to guarantee a smooth process. Your keys will be stored securely in a safe for you. Meet & Greet is the perfect option for people with disabilities, as they can arrive in their own car, drive directly to their airport terminal and hand over their car park to a trained member of staff who will park it for them. Please print your booking confirmation and take it with you on the day of your departure. Additional repair and paint works available. Please drive directly to the airport. A staff member of ParkGentle will wait there for you and will drive your car to the car park to park it securely. Upon your return, a member of staff will be waiting for you at the airport to return your car to you.